**[About "Golden Movement"]** Corresponding to our https://www.pinkoi.com/store/laillimitecrea?tag=%E3%80%8A%E9%8A%80%E6%9B%B2%E4%B8%89%E9%87%8D%E5%A5%8F%E3%80%8B is an asymmetrical series made up of different gold chain shapes in 2018, and this series will be different from the traditional symmetrical type, closely related to our brand concept - Asymmetrical aesthetics give you a more special design. **[Product Information]** **▲ size** ☑Customer size ☞ length is made according to demand, no adjustment chain. 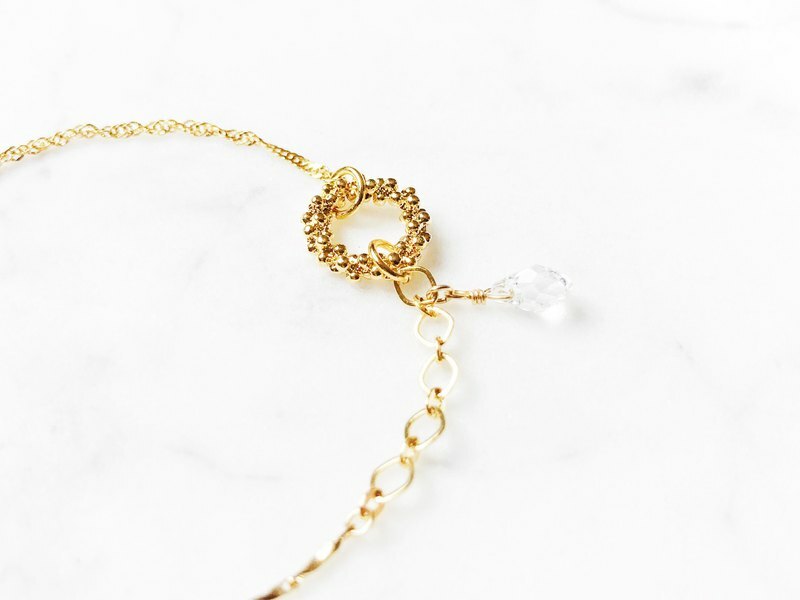 **▲ chain color** Gold **▲ chain width** About 0.10-0.12 cm About 0.12 cm About 0.35-0.40 cm **▲Material** ☑Swarovski crystal Beryllium Copper Plated Gold/Copper Alloy Gold Plated / Japanese Plated Alloy (Gold Plated) ☞**"About Gold Plated Material"** It is a lossy accessory and cannot be restored. The coating will vary in degree of wear and oxidation depending on personal habits and conditions. The length of the color retention varies from person to person and can be from a few days to several years. Please do not wear sleeping, washing hands, bathing, swimming, hot springs, maintenance of makeup and other chemicals, etc. Please avoid contact. If you cannot accept this material feature, please do not place an order. **▲Packing** ☑General packaging (basic appearance / convenient collection) If the product is not upgraded and packaged, it will be placed in the same box (bag) after being easily and independently packaged. If there is full packaging demand, please note when placing the order. ☑ upgrade boxed (beautiful gift / basic collection) ☞ https://www.pinkoi.com/product/1xLDlBvR?category=3 ☞ https://www.pinkoi.com/product/1fR9zBUU?category=3 Whether the product is suitable for purchase and upgrade, please refer to the above link to the store description or use the station letter to ask, thank you. -------------------------------------------------- ---------------------------- **[Working days]**Please read the working days of the goods carefully before ordering. If you are in a hurry or have any questions about the delivery time, please contact us first. After the order is placed, the notice or note is urgent and will not be accepted! **▲Product production** The products of the design hall are customized for the order, and the working days are counted after the payment is completed (the first working day is calculated every other day after the payment is completed). The products are hand-made, and the number of working days will vary according to the production status of the order. Generally, it will take about 7-21 working days (excluding shipping time), and the actual shipping time will be the main one. ☞ https://www.pinkoi.com/store/laillimitecrea will help you estimate the number of days you will wait. The waiting time will be changed according to the progress of the work, and the actual shipping time will be the main one. **▲ merchandise delivery** **运送Taiwan shipping time** The mailing registration is about 1-2 days, the supermarket picks up the goods for about 2-3 days, and some of the farther areas may be served 3-5 days. (excluding Saturdays and Sundays and national holidays) **运送Not transit time in Taiwan** Shipped by**China Post POST Airmail**(unable to keep track of the status of the goods), depending on the destination, the number of days of delivery is different, approximately 10 - 14 working days after delivery (excluding Saturday and Sunday) And national holidays). -------------------------------------------------- ---------------------------- **[Precautions]**确认 Please confirm the precautions before purchase. All products are customized products. No return and exchange services are available. To avoid future disputes, please be sure to accept the order. **▲Before placing an order** In addition to the custom size and packaging requirements, there are any problems or things that we would like to pay more attention to,**please do not place a message directly in the order remarks column**, we can not know the time you want to convey in the first time Please feel free to contact us using the station letter. Most of the products in the design hall can't stand the pull, so please evaluate your own habits before placing an order. Meanwhile**Please understand the situation of loss of material goods you have ordered in the future that may occur**, determine acceptable to buy. If the merchandise is innocent at the time of delivery, the condition of non-original delivery will occur after being worn and used. It will be repaired and treated, and the cost and postage will be collected according to the situation. If you want to choose a VIP with a very custom size, please contact us using the station letter before ordering. Failure to contact us may result in delays or disputes due to unclear effects on dimensional adjustments or inconsistent order amounts. ☑Customize the item to be informed or choose a VIP with a very custom size. When ordering, please be sure to fill in the size of your order (cm) (size contains reserved space) and style. . Failure to actively inform will delay the shipment of goods. When placing an order, please pay more attention to whether the address you filled in is correct and whether the name matches the ID card (or passport). In case of personal reasons (and not limited to filling in incomplete information, incorrect or unreceived items), the case of uncollectible or the return of the parcel will be refunded, in addition to the possibility of paying the storage fee or returning the freight. Resend it. If you are unable to contact you by means of a letter or newsletter, we will save you for one month and will not be liable for any overdue. VIPs sent to overseas areas will be charged as above if the package is returned. If they are not returned to the destination to wait for authorization correction, we will charge an additional NT.50-100 yuan for the cost of the transaction. (including document postage). 贵If you are worried about whether the product will cause allergies, please do not place an order. Because everyone has different allergies, there is no way to measure it. 订 The order price of the product is a floating price, which will increase or decrease according to the price of the raw material. If there is a price fluctuation during the waiting period, the following order price will be the main price, and the price fluctuation or other factors will not be accepted. We reserve the right to change prices without prior notice. ----------------------- **▲After receiving the goods** ☑If you receive any doubts about the size or defects after receiving the goods, please feel it within 7 days after the receipt, if it is not accepted within 7 days, it will be listed as a repair product to help you with the follow-up treatment, and the cost of the work will be collected according to the situation. postage. If you lose it yourself, or if other factors cause damage to the product after wearing it, the defective part will be too large to be repaired, and it will not be listed as a repair item and you will be responsible for the full cost. ☑Design Hall products are customized, no other sizes are available for replacement. Except for some disposable consumables, they can be modified. If it is not the negligence of our production (within the license error), we need to pay back and forth postage. And material costs. Due to the special materials, styles or production methods, some products cannot be changed in size after completion, and there may be no possibility of repair after damage. ----------------------- **▲About the product itself** ☑ arrangement Products will be slightly adjusted according to the length. The designer reserves the right to adjust the arrangement and proportion of the goods. ☑present In the event that some materials are out of stock or a small part of the parts are adjusted, the designer will retain the right to adjust the small parts without any notice. Length Since the goods are all hand-made, it may also be due to the error in the ruler and the way each person measures it, but there is a dimensional error (within ±0.5 cm). The length of the size provided at the time of ordering is for reference only. ☑ natural stone 瑕 Each pearl and natural stone has different shades and textures. Some have small cracks or other flaws such as impurities. There is no way to be as perfect as artificial pearls and precious stones. There are also irregularities in the size and shape of natural stone, so there is no way to match 100% of the product images. If you are unable to accept the above, please do not place an order to purchase. Hand made traces Because the goods are hand-made, the finished product may have traces of hand-made (such as knots or asymmetry, unevenness, etc., does not affect the wearing situation). There is no way to be as perfect as a machine, so please consider carefully. Color difference All items in the picture may have a color difference due to factors such as the light being shot or the brightness of the PC screen. Different batches of goods may also have some slight differences in color.